This is not really that new but I like the design though. Simple swirls and different citrus and halftone behind the fruits. 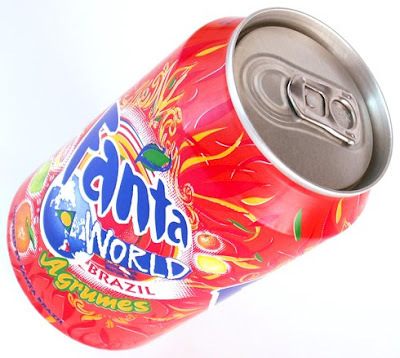 However on the buttom inspired by Fanta Brazil should been left out because it did not fit with the design, making it less clean than it could. The colors used on this can is pink ( somehow it's became red in the pictures), red, green, yellow and dark blue. For the taste, it like pomelo but with more real grapefruit taste. And for all the rest of the citrus you don't really taste them over the grapefruit.